Nothing goes together better than sweet and spicy, which is exactly what a mango salsa recipe offers. This easy-to-make flavor combination is great over fish, on top of teriyaki burgers, or can be served as a fancy dip to wow your guests. 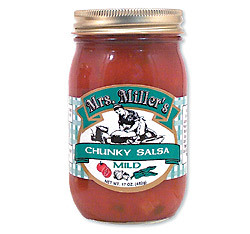 If you get really good at making the recipe, adding your own personal touches, you can put the salsa in a jar or can and sell it. Next, mix all of the ingredients together in a medium bowl, cover, and let it sit for a minimum of 30 minutes before consuming. 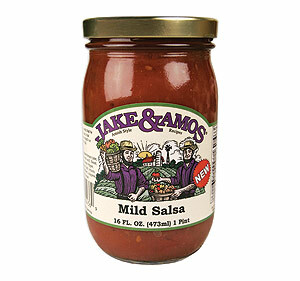 Once the flavors have developed, this low calorie, no fat salsa can be served to up to eight of your guests, though you may double or cut the recipe depending on how much you need. This next mango salsa recipe requires the use of a whole jalapeno pepper, which means leaving the seeds, which are the hottest part of the vegetable, in the mixture. Aside from this minced jalapeno, stem removed, this recipe also calls for a peeled, pitted, and diced ripe mango, half of a finely chopped medium red onion, and a small cucumber, peeled and diced. In addition, you are required to have three tablespoons each of fresh, chopped cilantro and fresh lime juice as well as some salt and pepper for seasoning. Optional ingredients for this recipe are diced red peppers, which can replace the jalapenos if you don’t want the spice, and jicama, if you prefer a little more sweetness. After chopping, peeling, and dicing all of the ingredients, simply combine them in a bowl, mix, and enjoy on roast duck, barbecue dishes, or as a standalone dish. If you find the salsa to be overwhelming, dice up some avocado and add that to the mix. What makes this recipe so different from the others is that, aside from being more colorful, it is not at all spicy because it does not require the use of a single pepper, though you can always add a chopped chile if you so desire. You may also elect to use more lime juice if you prefer sour tasting foods. By the same token, for those who like more cilantro, add as much as you want. After preparing your ingredients, simply combine them all and mix gently before serving. 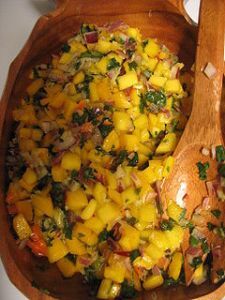 If you are not going to consume this prepared mango salsa recipe right away be sure to cover it and store it in the refrigerator, where it can last for about three to four days.